1Q19 Revenue and PATMI was 5.6% and 6.5% lower than estimated respectively, due to weaker than expected revenues from Post Trade Services and Issuer Services. Securities business missed our estimates by 6.6% as the weaknesses in emerging markets and concerns over economic conditions lead to weaker flows. Derivatives business was the standout performer, achieving strong record revenues with a surge of 17% YoY in volume. Interim dividend per share spiked up 50% to 7.5 cents (1Q18: 5 cents); due to a change in dividend policy announced last quarter. 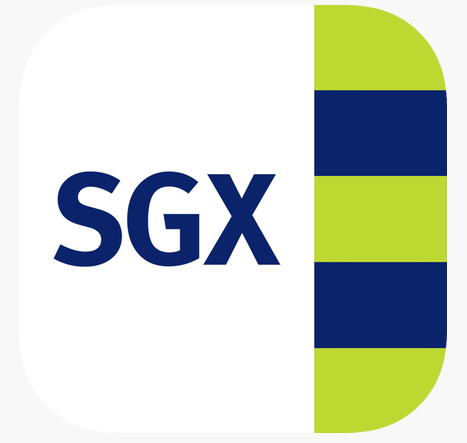 We maintain our BUY recommendation for SGX and raise our Target Price to S$9.01 (previously S$8.93). We have changed our valuation method from DCF to P/E ratio multiple. Our Target Price is driven by 25.2x PER, in line with SGX’s peers. + Derivatives revenue achieved a record of S$98m, rising 21% YoY offsetting the decline in equities and fixed Income revenue. Within the derivatives business, equities and commodities volume spiked 17% YoY in volume term, reaching a high of 54mn contracts in a quarter. Improvement in volumes came from China A50 futures and FX futures products, which benefited from higher volatility in the underlying market. However, the average fee per contract was down 6.3% YoY to S$1.05 due to changes in product mix towards lower yielding products. + Collateral management, license and other revenue grew 48% YoY. With rising volatility, risk management solutions have seen an increase in demand. SGX was able to register higher open interest and collateral margin balances. + Market Data and Connectivity revenue up 2% YoY, accounting for 12% of total revenue. The growth was due to higher derivatives API subscriptions and expansion of SGX’s colocation services business. – Securities revenue contracted 8% YoY. The contraction was caused by current weaknesses in the emerging markets and concerns of a slowdown in economic growth. Despite volatility created by the trade war and rising interest rates in the stock market, securities revenue growth was dampened by the slowing SDAV which decreased 8% YoY. However, average clearing fees for Equities and Other products remain stable at 2.88 bps (1Q18: 2.87 bps) and 0.56 bps (1Q18: 0.55 bps) respectively. – Fixed Income revenue fell 13% YoY. Issuer Services declined 12% YoY due to lower bond listings. 1Q19 had 247 bond listings raising S$92bn as compared to 347 listings that raised S$156mn of funds a year ago. Equities listings was stable YoY. 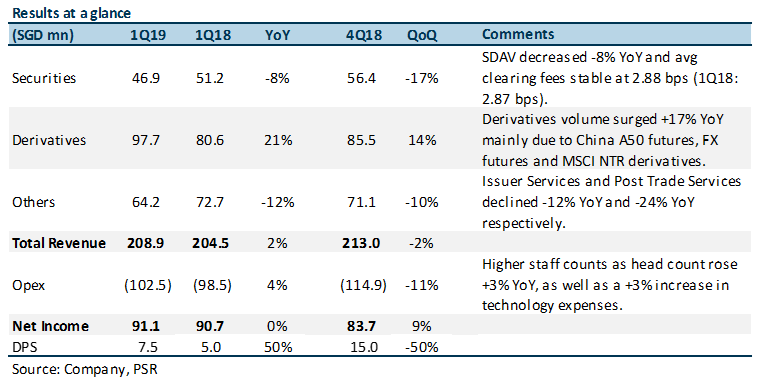 Post Trade Services was down 24% YoY due to decreasing subsequent settlement activities (we believe that this segment is stagnating and would not contribute meaningfully to SGX’s growth in FY19), downward repricing of DVP guarantee fee and complete cessation of contract processing revenue in 1Q19 (following completion of broker-migration in February 2018). During the quarter, SGX made strategic investments to expand its Fixed Income business as well as to create a digital marketplace for the freight industry. This will allow commodity trades to connect with the freight industry. With the cessation of contract processing service following the completion of broker-migration in February 2018, SGX will be launching a New Post Trade System (Phase 2) in December 2018. The new revenue opportunities are (i) New settlement instruction; (ii) Broker linked balances, (iii) Securities borrowing & lending, and (iv) FX conversion. 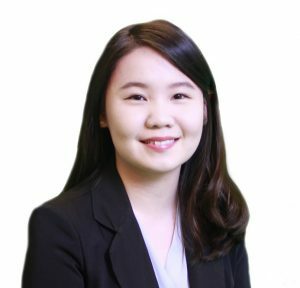 The SGX-IISL arbitration has no further updates and remains as a financial risk whose outcome has yet to be set in stone. Its diversified earnings growth is supported by its multi-asset strategy, volatility, operating leverage and a robust balance sheet. Continued stock-market volatility driven by the US-China trade conflict and rising interest rates should benefit derivatives turnover. SGX’s debt-free balance sheet and monopoly helps in facilitating inorganic growth. We maintain our BUY recommendation for SGX and raise our Target Price to S$9.01 (previously S$8.93). The increase in Target Price is mainly driven by 25.2x PER, which is in line with SGX’s industry peers (Table 1). SGX’s attractiveness as an investment in the medium term remains intact with superior ROE, dividend yield and attractive valuation as compared to its regional peers. We believe that the stock has priced in the loss of Indian derivatives revenue and lacklustre volume growth. Also, SGX is a defensive stock with consistent and diversified earnings, valuation and dividend support for resilience in an uncertain environment. We have changed our valuation method from the Discounted Cash Flow Model to Price-to-earnings ratio multiple. We believe the P/E ratio is a more suitable investment valuation indicator for SGX due to its consistent generation of positive, predictable and robust earnings quality.